A struggle over a bowl of popcorn begins another time-travelling adventure for Nick, Jackie and Hannah. When Mr. Barrington's trunk magically appears on the Taylors' kitchen table, a family of slaves steps out, followed by a snapping dog. Jackie is mistaken for an escaped slave and kidnapped by a hideous man. Trying to save her, Hannah and Nick are transported back to June 1865 only to discover that even though the Civil War has ended months before, many Texas plantation owners still own slaves. Befriended by twins Sam and Lily, the time travellers witness horrific truths of plantation life: whippings, beatings and families being torn apart. After Lily is sold to another plantation in Galveston, they devise with Sam a plan to rescue her. Their race against time takes them through a spooky graveyard and over a river teeming with alligators, with vicious hounds in close pursuit. 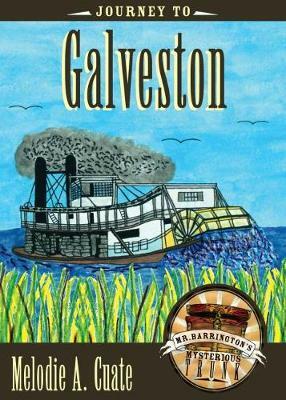 Hannah, Jackie, and Nick are transported back in time from an America with an African American president to the troubled Civil War era, where all three experience first-hand the cruelty of slavery and the promises of freedom when General Gordon Granger came ashore in Galveston in 1865. This momentous arrival spawned a new era in race relations in Texas and the celebrated African American holiday of Juneteentha day of jubilee, jubilation, and Joshua-like pride and dignity. Maceo Crenshaw Dailey, Jr., director, African American Studies, University of Texas at El Paso"